Neotek Inc. is a family-owned, US-based LED lighting fixture manufacturer for commercial, institutional, industrial, and residential applications throughout North America and select international markets. With over 30 years of experience in the lighting industry, we understand the commitment necessary to earn your trust and your loyalty. Our company was founded on integrity and craftsmanship, and we work for the professionals who design, deliver or construct lighting systems, and for the people who inhabit those spaces. With installations domestic and worldwide, Neotek is universally specified for the most demanding and prestigious applications. In addition to standard products shown on this website, we also specialize in custom design and manufacturing for various types of unique applications. T H E D E S I G N E R who must balance the aesthetic, functional, environmental and economic requirements. T H E A R H I T E C T O R D E S I G N E R seeking lighting solutions that enhance their designed environments. T H E B U I L D E R who needs a real project collaborator. T H E O W N E R S & T E N A N T S looking for lighting systems that are as affordable to install as they are to operate. E V E R Y O N E who spends time in their illuminated environments. Neotek began manufacturing and installing cold cathode and neon systems for lighting designers and architects domestically & worldwide. By creating the first patented and UL approved cold cathode fixture with a self-contained transformer, Neotek changed the way cold cathode had been installed since the 1920’s. Neotek began designing and manufacturing stock and custom LED light fixtures for commercial & residential projects. By utilizing both stock designs and our ability of creating and fabricating new ones, Neotek has become one of the top industry leaders in providing professional LED lighting systems for both interior and exterior applications. Because we engineer every stage of design and manufacturing on all our products and systems, we understand every detail, feature and best practices for the correct product and/or application. We are ready and capable to assist at any stage of project design development. While any of our products or systems can be purchased and installed by a local electrician, Neotek offers full turn-key installation services including estimating, field measurements, equipment and final installation. Our highly trained installers are experts in the field and provide fast, safe and reliable installs – proving the quality and service support you expect. Neotek offers unique lighting solutions from conception to product placement, for either custom fixtures or modified designs from your conceptual drawings. 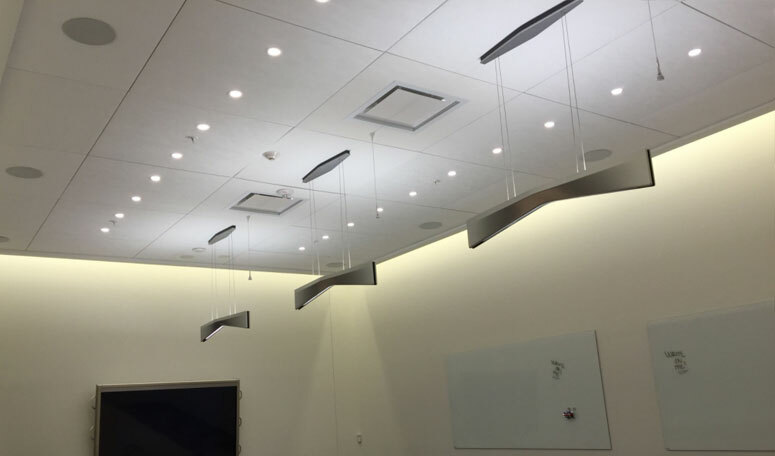 State of the art equipment along with our expertise, we can fabricate a variety of lighting parts & systems efficiently, insuring your project stays within budget. Our ability to quickly modify products to your specifications has been a key ingredient in building lasting relationships with architects, engineers and designers. We have rapid prototyping capabilities and a flexible manufacturing processes to meet the needs of each individual customer. We can assist you with updating older lighting systems. Our team service’s many different types of existing Cold Cathode and LED systems. Most all old cold cathode lighting systems can be converted to LED linear lighting. If you currently have a Neotek CCF system, see our retrofit units in the LED linear lighting section of this website.